Our range of products include 230v dynamic balancing equipment, field dynamic balancing equipment, acd 15 dynamic balancing equipment and dynamic balancing machine. 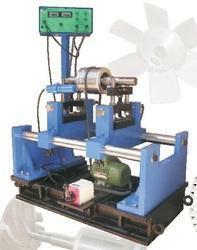 Rotating Machinery users are aware that Vibration free machine means increased reliability and long life. Vibration free machines also mean reduced wear and tear. High standards set by present day technical advancements require quality Balancing Machines. ‘ACD’ Dynamic Balancing Machines are developed through technical and highly specialized experience in the field of Electronic measurement of Mechanical Vibrations, based on the field experience and feed back received through over 1600 users of our machines for the last 35 years. Stroboscopic / Digital Location Readout. Simple To Operate - Simple To Service. Job Weight Specified Included Weight of The Mandrel. Balancing Speed Need Not Be Same As Operating Speed. These specifications cannot be generalized for all type of job E.G. 1 KG. Rotor could be balanced on ACD 1 but 1 KG. Impeller cannot be balanced. All bodies possessing Mass and Elasticity are capable of generating vibrations. Most rotating machines and structures experience vibration to some degree. In practical terms, Unequal distribution of mass results into unbalance, which causes vibrations in the machine. Excessive vibration can cause bearing wear, improper machine performance, noise discomfort and finally total breakdown of the machine. The method used to eliminate unblance is by addition or removal of the material in the position which completely counteracts the original unbalance. 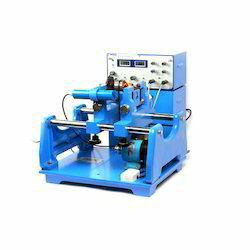 Function of the Dynamic Balancing Machine is to determine amount and location of the necessary correction. For conventional balancing, the rotating part has to be dismantled from the assembly, taken to the Standard Balancing Machine, mounted on cradle, coupled to and driven with a suitable prime mover. This Portable equipment (Field Dynamic Balancing Equipment) would enable the operator to carry out balancing without dismantling the machine, rotating the component in its own frame. Thereby saving expensive labour and costly down time. Furthermore, it gives better results than the conventional balancing„ as it can detect and correct the residual unbalance as well as the unbalance due to assembly, accounting for all the fitting tolerances. Balancing at operating speed is another advantage. This equipment is ideally suited for maintenance engineers in thermal stations, processing plants and other industries using rotating machines for on-site balancing of rotating parts. It can also be used extensively for periodically monitoring vibration levels for preventive maintenance. This equipment also incorporates a Vibration Meter apart from Field balancing set, which facilitates the abVibration pick-up used is the most sensitive pick-up of its kind available and it can be used in any position without loss of sensitivity. Signal conditioner is incorporated in a capsule with the pick-up, to give better signal to noise ratio and low impedance output. Vibration pick-up, when mounted on a vibrating body has no other influence like magnetic field or gravity. This is due to the principle of `inverted mass’ used. solute measurement of vibration in terms of DISPLACEMENT in microns or VELOCITY in mm/sec. Vibration pick-up used is the most sensitive pick-up of its kind available and it ca be used in any position without loss of sensitivity. Signal conditioner is incorporated in a capsule with the pick-up, to give better signal to noise ratio and low impedance output. Vibration pick-up, when mounted on a vibrating body has no other influence like magnetic field or gravity. This is due to the principle of `inverted mass’ used. This precision equipment is designed for accurate Dynamic Balancing in the field. The equipment is simple to operate and it can tolerate large line voltage fluctuations and temperature transients. The equipment is housed in a moulded suit-case for convenience and weights only 8 Kg. Job should be mounted on a firm sturdy base. Job should be running at constant speed. The job should have steady vibration reading. There should be approach to the rotating job or any component on the same shaft for observing location of the unbal ance. It should be possible to effect the necessary correction (addition or removal) in the job. Rotating Machinery users are aware that Vibration free machine means increased reliability and long life. Vibration free machines also mean reduced wear and tear. High standards set by present day technical advancements require quality Balancing Machines. ‘ACD’ Dynamic Balancing Machines are developed through technical and highly specialised experience in the field of Electronic measurement of Mechanical Vibrations, based on the field experience and feed back received through over 1600 users of our machines for the last 35 years. Table Top Belt Driven Models - No Foundation Required. Analogue / Digital Unbalance Readout. Simple To Operate-Simple To Service. These specifications cannot be generalized for all types of jobs E.G. 15 KG. Rotor could be balanced on ACD 15 but 15 KG. Impeller cannot be balanced. Rotating Machinery users are aware that Vibration free Machine means increased reliability and longer life due to reduced wear and tear. High standards set by present day technical advancements require quality dynamic balancing equipment and machines. Dynamic Balancing Equipment manufacturers, suppliers, exporters, dealers and traders in Mumbai India since 1970 to all over the world according client's requirements. 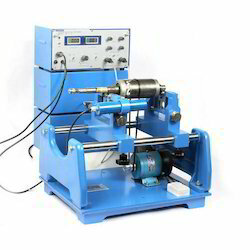 ACD dynamic balancing equipment and machines are developed through highly specialized experience in the field of Electronic Measurement of Mechanical Vibrations and feed back received through users of our Machines for the last 30 years. These specifications cannot be generalised for all types of jobs e.g. on acd 30’; 30 kg. rotor could be balanced but 30 kg. Impeller cannot be balanced.